Given that this is the inaugural edition, we thought that the first issue of the international journal «ArchAlp» needed to be characterized by a wide angle view, taking shape as sort of veritable tour d’horizon of the alpine space. Thinking with the scientific committee of the journal, it seemed to us that a reflection on the characteristics of contemporary architectural production in the European Alpine area, starting from regionally-based analyses and interpretations, could be very important. A description of the state of the art, which in order to have scientific validity must be based on comparative interpretations, has the aim of restoring continuity and differences in the “building culture” among the various Alpine regions. From here the idea of building the central core around a series of local monographs. The first issue to be critically discussed is recourse to the category of regionality as a lens to investigate contemporary alpine production. In the field of architecture, the term “region” inevitably refers to the fields of architectural critique and historiography – such as critical regionalism – that investigate or support a close link between histories and cultures of the regional space and local architectural production, especially in a figurative and constructive perspective, with the risk, however, of favouring “static” visions based on the rediscovery of continuity and permanence. Visions often with a culturalist imprint in which the issue of a regionalist architecture – according to a fil rouge that spans the whole of modernity – often intertwines with those of artistic and literary production. At the same time it was important to pay attention to the different national meanings of the term, for example in French the term regionalisme means directly – not only recently, but over the entire last century modernity – a certain vernacular idea strictly connected to the development of the architecture des loisirs. Certainly more productive is the dialectic comparison of the term “regionalism” with that of “internationalism”, which has constituted a significant key to interpreting architectural production of twentieth-century modernity. Similar risks of reductionism can arise from a mechanical-sociological interpretation of the relationship between a socio-economic context of a given territory and its architectural representation, to the detriment of the many components that can represent the foundation of building production. At the same time recent critical contributions confirmed that it is a significant interpretative lens, for the alpine territory in particular. For example the edition 104 of the South Tyrolean journal «Turris Babel» that discussed the results of a research by EURAC (Research Institute for Regional Development) right on the relationship between regional spaces and architectural production/cultures, inquiring into the territories of the South Tyrol, Trentino, Grisons, Tyrol and Vorarlberg. Once understood the “productive” value of such interaction between the two terms, it was important to discuss the term region not only on the architectural, but also – and this is the second issue – on the truly territorial front. While in the first decades of the twentieth century, the processes of modernisation and integration of the Alpine space still focussed on a regional dimension, the period after the Second World War and the following decades were characterised – albeit in the presence of diversity among places – by a progressive standardisation of territories, based on mass tourism, depopulation and the process of European unification and infrastructure building. Only starting from the seventies and eighties of the twentieth century did a process begin that would lead to strengthening, and in some ways reinventing, the regional dimension of the Alpine space. A process that saw the consolidation of local autonomies at its centre – which would, among other things, result in the diversification of landscape, urban planning and regional building legislation and regulations – but also a differentiation of local territories in terms of development, tourism, production and economic policies and practices,or also of construction of new collective imaginations and identities. From this point of view, then, with respect to architectural conceptualisations such as that of critical regionalism – the architecture that builds the regional character – the issue is turned upside down, with institutional, cultural and economic policies that can determine the regionality of the built landscape. In the background, the increasingly marked divergence of the trajectories of the German-speaking Alps from those of the neo-Latin-speaking areas. The significant attention to the ecological culture that took shape in central and northern European countries towards the end of the twentieth century was applied to the Alps: not only nature conservation and soft tourism, but also technological innovation, alternative energy production, eco-building in relation to the availability of local materials, forest management and sustainable transport. The case of Vorarlberg, and not only for architecture, is emblematic. In the Latin Alps the main protagonists, on the other hand, would be the issues of promotion of tradition and of the historical-cultural heritage, with centrality of the tourism dimension that would represent a limitation of this experience. A divergence multiplied by regional and local differences. If the “Alps of the regions” – that is going today through a difficult period as the idea of Europe itself opposite to the growing populisms and right-wing sovereigntism – have therefore become particularly significant in recent decades, the same can be said in relation to architecture. Although not a question of schools or trends necessarily of a unitary nature, it is common to speak of Grisons or Vorarlberg architecture, meaning with these expressions the emergence of high quality architectural productions that entertain particular relationships with their territories. In this attempt to discuss the relationship between architecture and regionality in the multiple and “dense” articulation evoked above, the decision was to organize this edition around three specific cores. In the first part a series of contributions by historians, geographers and mountain experts (Werner Bätzing, Luigi Lorenzetti, Carlo Olmo) aiming at studying in depth the connection between space and time in the definition of architectural practices and cultures. • the montagnité of high quality architectural production and the way in which the Alpine space is conceived. The authors did not always follow this canvas in the construction of their essays, but we think that the texts as a whole depict an outline with original characteristics that never existed before. 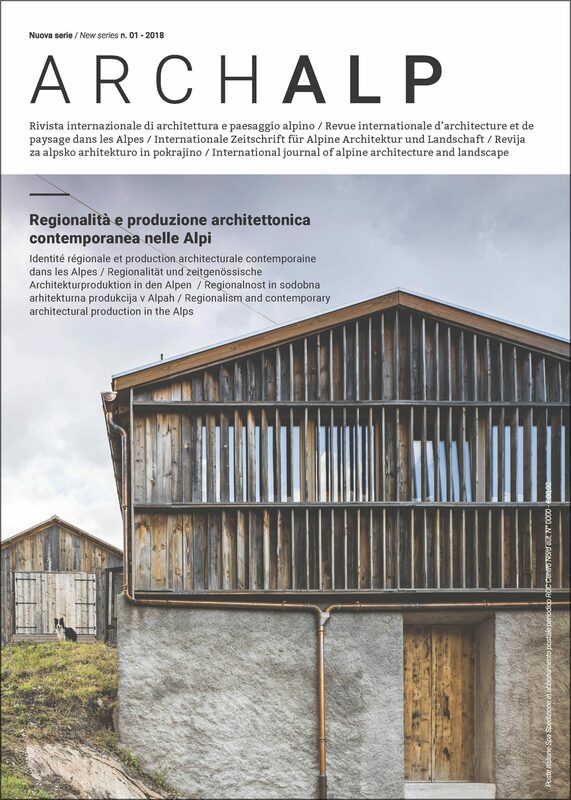 The third and last part collects some articles that interpret the results of recent awards – Rassegna Architetti Arco Alpino, Constructive Alps – in a regional architectural production perspective. Correspondents. A special thank goes to Armando Ruinelli, who has been decisive in the connections with the German speaking authors – without his support this edition would have never existed, to Werner Bätzing and to Luigi Lorenzetti.